Order a 15 gallon drum, and do your own DPF filter. Rinse both ends with water hose in wash area removing loose large deposits. Get a 30 gallon Plastic Drum, or a 15 gallon Plastic Bin if your filter will fit laying down in it. 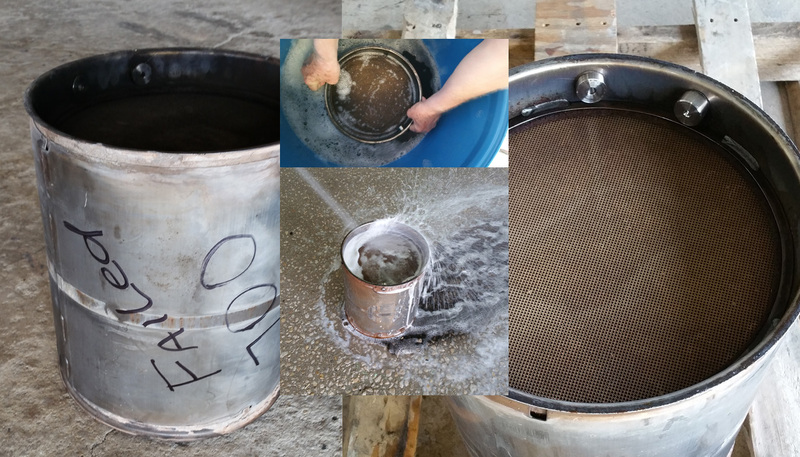 Use 2 Bricks or 2" square tubing to place on the bottom of drum to set the DPF Filter on. A steel rack can also be used. Place DPF filter on top of rack and fill with Cobra Clean. You want enough Cobra Clean to completely submerge the DPF filter. Next day remove filter and place in wash area. Flush with water hose and spray nozzle until clean. Make sure to flush from both sides. Let filter dry on a pallet or blow dry with a shop vac. Replace filter and take the crew to Steak House on money saved.